Today i will discuss how to configure VLAN based traffic shaping on cisco Catalyst ME3400 switch. Suppose you have 4 vlan [21,22,23,24] on a trunk port & you want to bandwidth shaping specific vlan 21 & 22. Here we declare 5Mbps BW for Vlan 21 & 2Mbps BW for Vlan 22. You can enable bandwidth shaping on an interface (or sub-interface) in three easy steps. Just remember: class, policy & interface. At first you need to create a class map for those Vlan. Here we create vlan21 & vlan22 as a class map. Now it’s time to define our policy map. In this case, we’re going to take any traffic that matched the vlan21 & vlan22 class (which, as you remember, is all traffic) and apply a shaping policy to it. Also we create subvlan & mainvlan policy map. 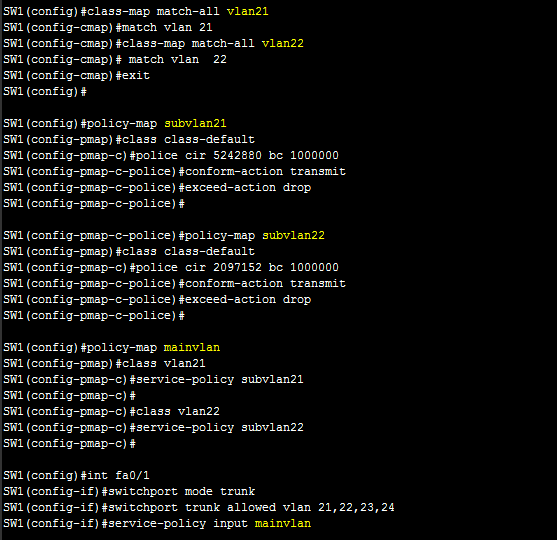 Here we create subvlan for traffic shaping & create mainvlan for aggregate two subvlan in a policy map. Finally, we need to apply the policy map to an interface using the service-policy configuration command. Here we apply it fa0/1 interface. I think this configuration will work only for the input traffic , as the match vlan will not work for the output policy right? How can I do that for output traffic?